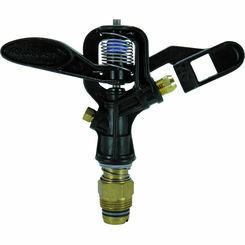 Toro 89-3978 570Z Series Pop-Up Sprinkler 4"
Everyone loves the look of lush, green grass. 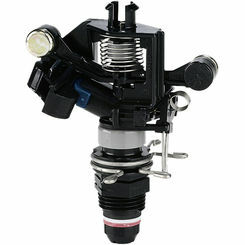 Having the right sprinkler system can make all the difference in your endeavors to grow your perfect lawn! 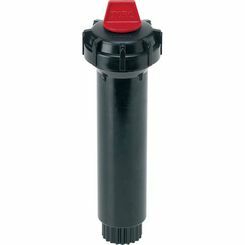 PlumbersStock offers huge discounts on the best sprinkler heads to ensure you can complete your project without spending an arm and a leg. 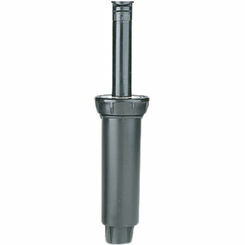 The most important way to aid your growing grass is to ensure that your sprinkler head covers the lawn evenly. Without even coverage, parts of your yard will receive too much water with the other parts in need of more. The under-watered portions of the lawn will wither and die, leaving unsightly brown patches. Surprisingly, over-watering can create a similar effect, but the over-watered portions will turn a yellowish color. Therefore, it is vital to provide even coverage to afford your yard with that lush, green, run-around-barefoot look. 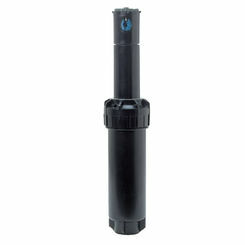 The best sprinklers are designed with different spray patterns, so you can customize your watering to your lawn shape. Before you head out to buy your sprinklers, here are some good tips of how to find what works best for your lawn. 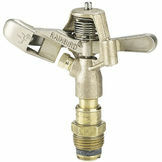 Spray heads are probably the most widely used type of sprinkler. 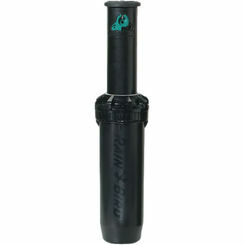 They are best fit for small to medium sized yards as they emit a fine, misty, fan-shaped spray. 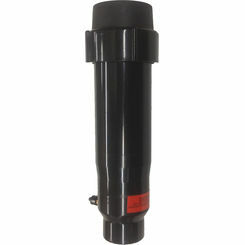 This allows for a high application rate, meaning there is a higher amount of water emitted in a shorter period of time. 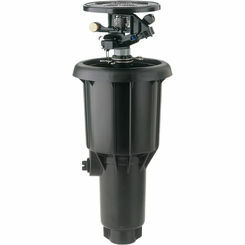 Spray heads come in both fixed and rotating varieties, allowing you to customize your spray to your lawn. 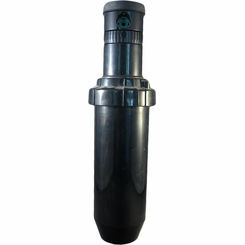 Pop-up sprinkler heads with this type of spray will be fixed. 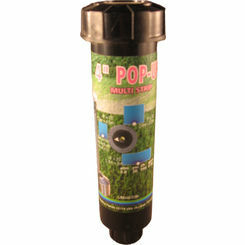 For the main portion of the lawn, it is recommended to use pop-up sprinklers that can be retracted into the ground to prevent any injuries to people. 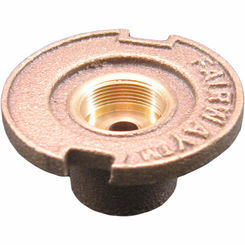 Spray heads come in different spray patterns, ranging from quarter circle to full arc (360°). Make sure to check the spray distance of your sprinkler head part so you can ensure head to head coverage, meaning overlapping coverage. As mentioned earlier, it is very important to get full, even coverage of your lawn to ensure even growth. You can always adjust your spray down, so you will want to err on the side of having your spray heads too close rather than too far apart. 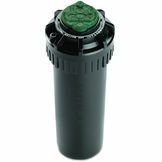 Rotary heads, also known as impact rotors, are ideal for covering medium to large sized lawns or areas. 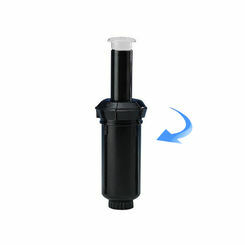 Rather than emitting a fine mist, they spray a single stream of water and rotate to cover the area. 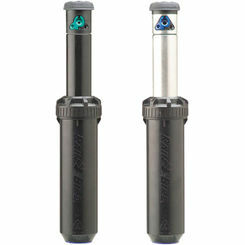 These maybe the best sprinkler heads for your needs but just know that they are sometimes loud. 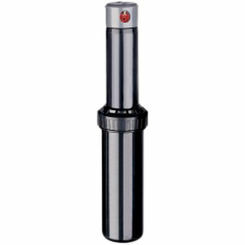 They are easily recognized by the clicking noise made as it rotates back and forth. 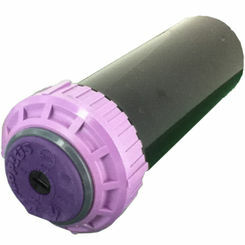 These require a higher water pressure than spray heads, but give out water at a slower rate. They are often made of metal or brass, necessitating a higher initial cost but they are also known to last for a significant longer amount of time than the plastic varieties. 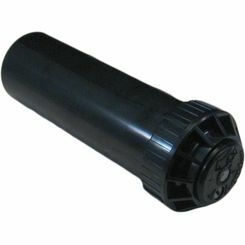 They can be easily adjusted to fit your ideal arc and width coverage. 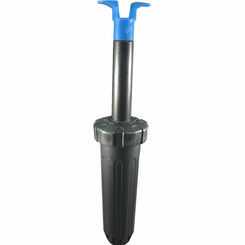 Bubblers are ideal for watering trees or shrubbery. You do not want direct spray it can cause damage to the bark and leaves. 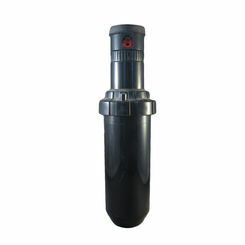 These sprinkler head covers emit a high volume of water and are located very close to the ground to facilitate the water getting deep down into the root system. 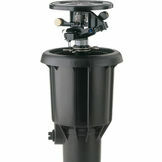 Bubblers are much less exposed to evaporation or wind because of the water being so close to the ground.  We have plenty of options when it comes to the industry's trusted brands. 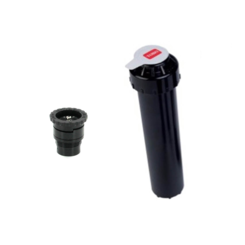 When you need a quality sprinkler head, Toro, Rain Bird, K-Rain, Orbit, Irritrol, and more discount options can be found right here. 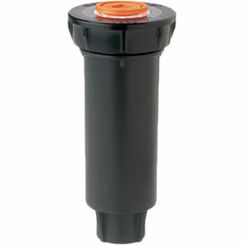 With so many sprinkler head parts to choose from here at PlumbersStock, you are sure to find the right combination o meet your lawn's specific shape. 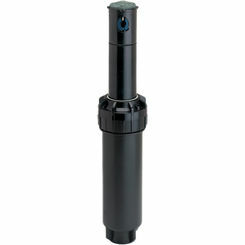 If you have any questions about measuring the area your sprinkler head covers, installation, products, etc. please feel free to contact our professional. 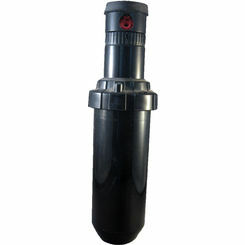 If you need sprinkler nozzles, we have those too!